​Unless you have studied animal biology you have probably wondered how a cow produces milk from grass? This is how it works. ​Unlike most mammals the cow has four stomachs not just one, the rumen, the reticulum, the omasum, and the abomasums. ​When a cow grazes grass or eats other fodder she swallows it half chewed and it goes to the first stomach, the rumen. In the rumen digestive fluids and bacteria soften the grass and when it is ready it moves naturally to the second stomach, the reticulum. ​​In the reticulum the grass is formed into small lumps called cuds. Acintya-sakti, inconceivable power. The cow, eating grass, producing milk—this is inconceivable power. Can you produce milk from the grass? But how the cow is producing? Hmm? Answer this. You eat grass and produce milk. Give your wife grass and let her produce milk. It is God’s desire. Cow is eating dry grass and producing the nicest thing, milk, full of vitamins. Now, if you think, “Oh, then dry grass and straw contain all vitamins. Let me eat,” you will die. You will die. It is God’s arrangement. ​After awhile these cuds return to the mouth and the cow then chews each for about one or so minutes. When the cud is swallowed it goes to the third stomach, the omasum. 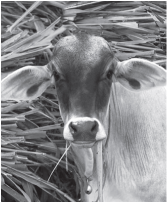 ​In the omasum the cud is broken down and nutrients from the grass are absorbed into the blood stream of the cow. The remaining cud then passes to the fourth and final stomach, the abomasums. ​In the abomasums grass is broken down even further by digestive fluids and from there it passes into the intestine, where the nourishment continues to be absorbed into the blood stream. ​​ In the cows udder is where the final miracle of milk making takes place. The udder has four identical sections and each section has a teat. In the udder the cow process her blood and transforms it into nutritious milk. ​​ The transformation of fresh grass to fresh milk is indeed a life giving miracle.